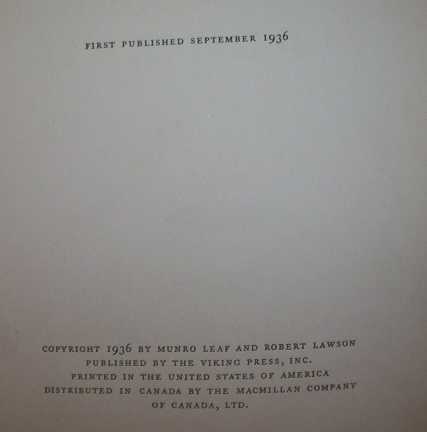 Copyright page: Line with “FIRST PUBLISHED SEPTEMBER 1936”. with no additional printings listed. Ferdinand was a national phenomenon in the late 1930’s after it’s publication. The anti-fight message struck a chord with a world infected with war. By 1938, in it’s first two years of publication, Ferdinand was reprinted over ten times. In 1938, Disney released an animated film “Ferdinand The Bull ”. Life Magazine, the leading periodical of it’s time, published articles on the book and it’s creators in two separate issues. The Feb. 21, 1938 issue featured a story titled “Ferdinand, The Bull Who Loves Flowers, Is Now A Grownups Hero” (Bibliophiles will love the Carl Sandburg cover; the article, however is about Sandburg singing folk songs?). The Nov. 28, 1938 issue highlighted the Disney film, along with photographs showing the multitude of toys and other cross-promotional material being merchandised. The magnitude of merchandising material would be common place today, however was ground breaking at the time. Ferdinand was the highlight of author Munro Leaf’s career. He was writer and illustrator for a series of “Can Be Fun” books (i.e. Manners Can Be Fun , Safety, Grammar, etc…), and did author a Caldecott Honor winning book, however nothing came close to the notoriety he garnered for Ferdinand. Illustrator Robert Lawson did have significant commercial success after Ferdinand , both as an illustrator and as an author. In 1937, he won a Caldecott Honor award for his illustrations for Four And Twenty Blackbirds, then won another Caldecott Honor in 1938 for Wee Gillis , which was authored by Munro Leaf. Lawson was the illustrator for Mr. Popper’s Penguins , which won a Newbery Honor award in 1938. Ferdinand has been in print since it’s publication in 1936, and has been translated into a number of foreign languages. How many fiction books published since 1936 have been translated into Latin? The anti-fight sentiment still rings true today.